Posted on August 19, 2007	by Linda S.
It’s been a while… blogger’s block, perhaps? I am learning to spin… using a spindle. I have to say I truly love it. And my hubby loves it too. He says I can talk while I spin but everything else I have to concentrate too much…grin We went to Hobby Lobby and bought dowel rods and toy car wheels, then came home and put them together. DH had to use the drill press to put the starter hole in the end of the dowel for the cup hook. A little sanding and we’re off! This spindle weighs 1.7 oz. The ball of yarn in the pic is one of the first few I did. Since I used needle felting wool from Hobby Lobby to practice with, needless to say it is quite stiff and prickly. So I used it to naalbind the purple and pink pouch to keep my weaving sticks and buttons together. Then I partially felted it in some hot water with soap to full the wool and close the spaces between the stitches. Turned out perfect. 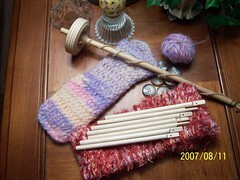 The weaving sticks are another use for the left over dowel rods. I taped 4 dowel rods together matching the ends. Then I measured and marked the exact center. My sweet DH then cut them for me on the chop saw. I measured about 3/4″ up one end on each stick and he flattened both sides to that point using his metal grinder. The drill press was used to put the holes in each one. I then sanded them smooth and ran a household candle up and down and all over each one… very smooth and easy to work with. The red fabric was woven using 6 weaving sticks. (Practice work to see if they would really work!) After this I tried using different colors and found that a change of colors was not hard at all. Next will be making some in different sized to use smaller sized yarn. Then will try making several lengths and then attaching them together for larger size fabric. This entry was posted in Crafts, Handcraft, Handwork, Naalbinding, Spinning, Weaving. Bookmark the permalink. 2 Responses to Long Pause Over…Hello again! So how do you use the weaving sticks exactly? Is there a tutorial somewhere? I really want to learn to weave, but am holding off based on my current lack of free time…. I’m not sure. There’s one for using soda straws to weave this way. I’ll put one up if you like.. it’s very easy. I’ve been waiting until I find some smaller dowels to make some that will fit better with the smaller yarns..